The Amorites were one of the chief nations who possessed the land of Canaan before its conquest by the Israelites. The Amorites dwelt on the elevated portions of the country. During the battle between the Israelites and the Amorites, God sent huge hail-stones down from heaven which killed many of the Amorite soldiers. 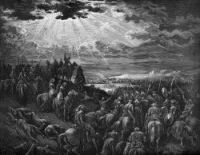 It is also during this battle, that Joshua asked God to perform the miracle of making the sun and moon stand still so that there would be enough light to see the enemy in the valley of Ajalon. The sun and moon stayed as they were for several hours, until all the Amorites were conquered. These pictures of the Amorites are from several old Bible books. Feel free to use these illustration of the Amorites in your projects. Click on the drawings of the Amorites below to see more details about saving a free Amorites image or about purchasing images of the Amorites at a higher resolution.